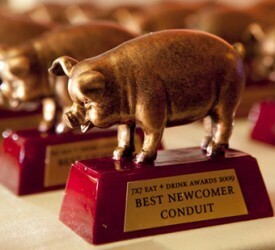 Maybe not quite on a par with the Grammy’s, but San Francisco’s 7×7 magazine recently announced their Eat & Drink awards (a.k.a the Piggies, since the winners receive their own bronze pig statuette.) The good news for Bay Area foodies is that seven of the award-winning restaurants will host pork-centric dinners on Monday nights throughout the month of February. You still have 5 left to make a pig of yourself at…just check out these scumptious sounding menus. Participating restaurants: Ozumo, Delfina, La Folie, Slanted Door, Laïola, Nopa and Kokkari—check out some of the amazing pork concoctions below. Smoked bacon cocktails and more! Behold below, the dates and menus—call restaurants directly to reserve your table!